Overwhelmed by the zillions of paint color choices out there? 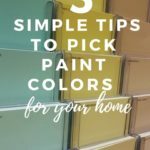 Believe it or not, you can learn how to pick paint colors for your home using some very simple tips and tricks. 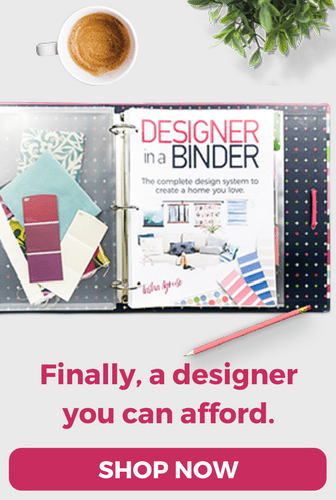 You do not need any interior design skills or education to master this failproof system! 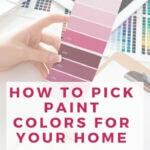 Without a doubt one of the most common questions I get from readers is, “How do I pick paint colors for my home? I am so overwhelmed. I don't even know where to start!” If that's how you feel, let me assure you that you aren't alone. I have been there myself! In our first house, I randomly picked out a red paint color for our kitchen. I didn’t test colors on the wall next to our cabinets. I didn’t even take paint swatches home to look at them before deciding. I just went to the paint store, picked a red color and went home and painted. And it was a disaster. I hated it. So I went back to the store and chose a different red and painted it again. Did I test the new color? NOPE. I figured the second one had to be better. I still hated it. FINALLY I took the time to bring some paint swatches home and hold them up next to our cabinets and chose a red that worked with the wood tones of our cabinets. I purchased paint for a third time and painted the kitchen AGAIN (this time by myself because I was too embarrassed to ask my husband to help me paint it AGAIN) and finally loved it. Well, the good news is that you don't have to waste your own time and money. 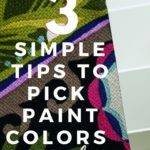 Below are my 3 simple tips for how to pick paint colors for your home. 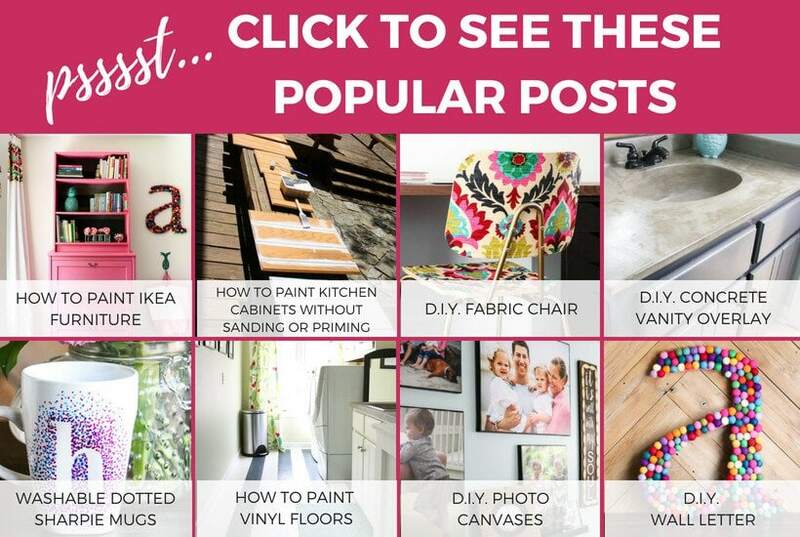 And if you want a printable version of these tips delivered to your inbox, just click below. Tip 1: Take a look at what colors you like wearing. 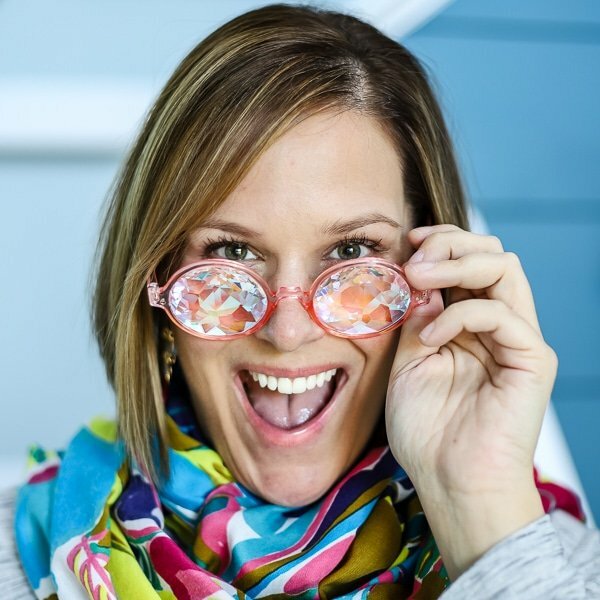 Most people buy clothes in colors they like to wear, and you should paint your rooms in colors that you love, too! 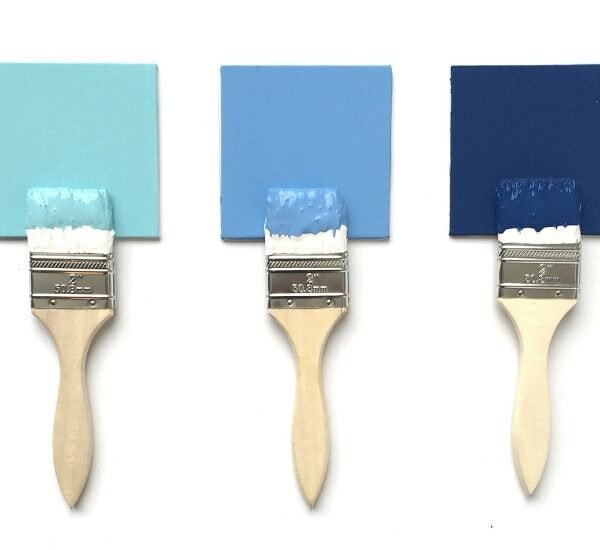 If you are obsessed with navy blue (like me), chances are you will love a home painted in hues of blue. Tip 2: Choose a color scheme from the largest pattern that you will be using in the room. If you've got patterned upholstery, a colorful rug or large piece of artwork, pick colors you like from the pattern. For a neutral wall paint color, look to the pattern's whites and beiges. If you don't have any pieces to go in the room yet, go the fabric store! 1) A white (and/or black…if you are daring like me, lol!). This white will be the color of your trim, ceilings, etc. I have white ceilings and trim, but am slowly painting all of our interior doors black (which you can read about by clicking here). 2) A neutral. This can be tan, grey or even a blue (yes, blue can be neutral–jeans go with everything, don't they?!). This color will bring everything together in your home and is the perfect color to use when you aren't sure what else to use. 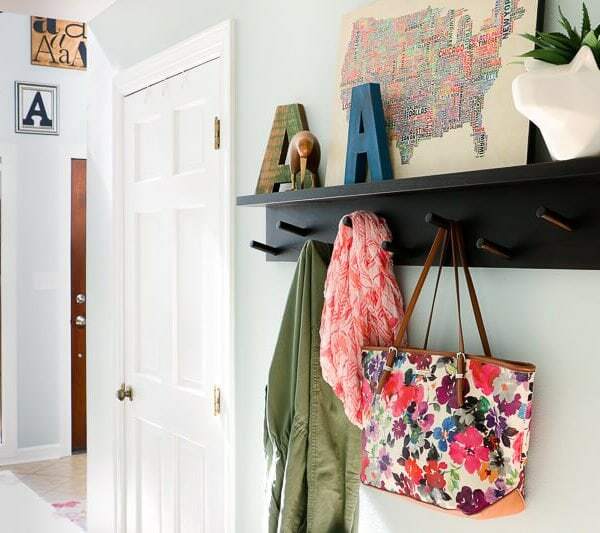 For example, your neutral is a great color to use in spaces that connect other rooms, like hallways. That means you really only have 3 hard choices to make, and you can use the fabric you fell in love with to help guide these choices. The most important thing to remember is that you should choose colors you love. Don't over think it. 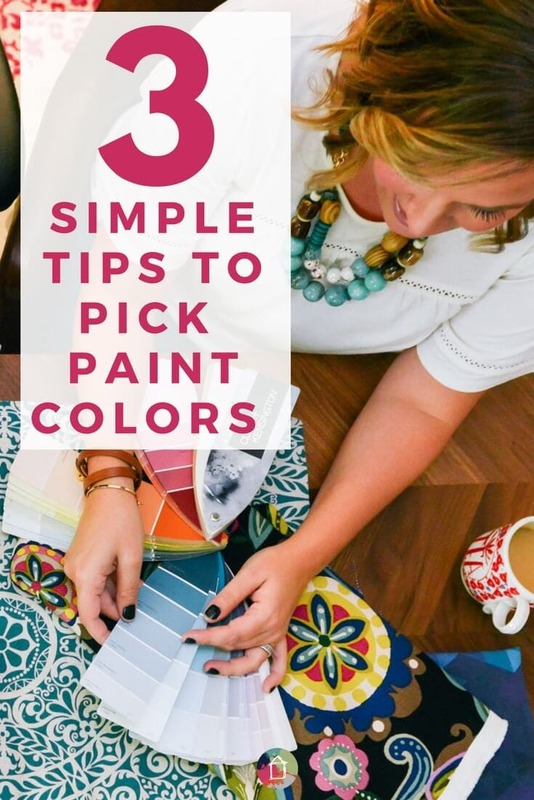 Just follow these simple tips and you will be on your way to having a color palette in your home that you love! Find a piece of fabric with several colors THAT YOU LOVE. 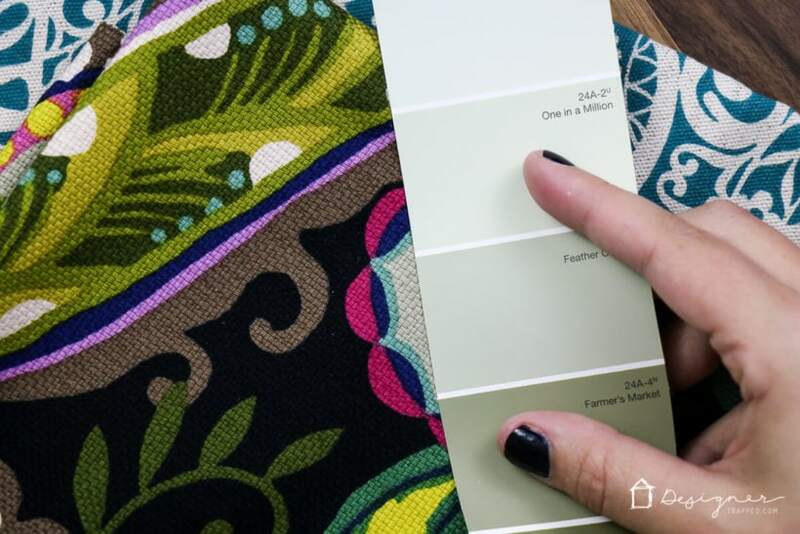 Since those colors work well together on fabric, they should work well together as paint colors! 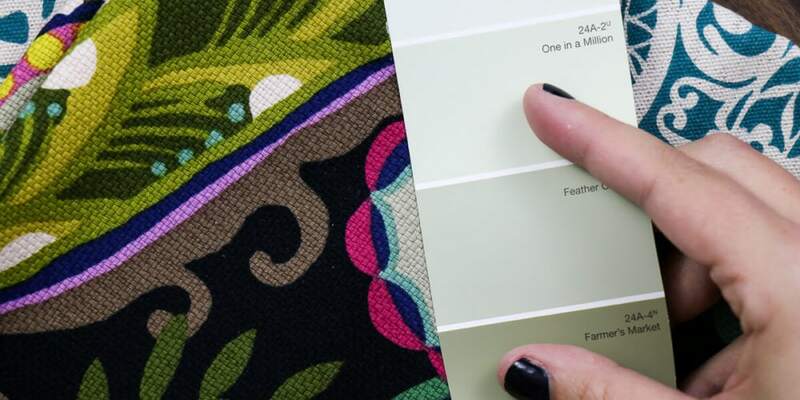 Buy a yard or so of the fabric so you can have it with you as you choose paint colors. The bonus is that you can use the fabric to make something later (it can be something simple like a pillow cover). That's it. I told you it was simple! 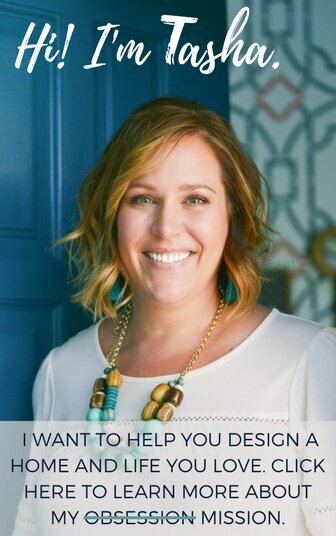 Now, if you find yourself confused by picking the perfect hue from paint chips (which is NORMAL, by the way), be sure to opt-in to my email list to have my FREE guide to understanding paint chips emailed to you. It's a total game changer and a must-read before you head off to the paint store. 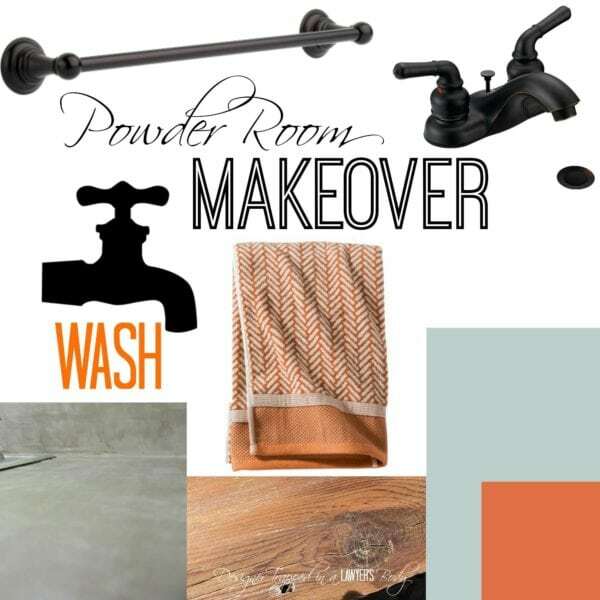 Makeover Plans for the Powder Room!